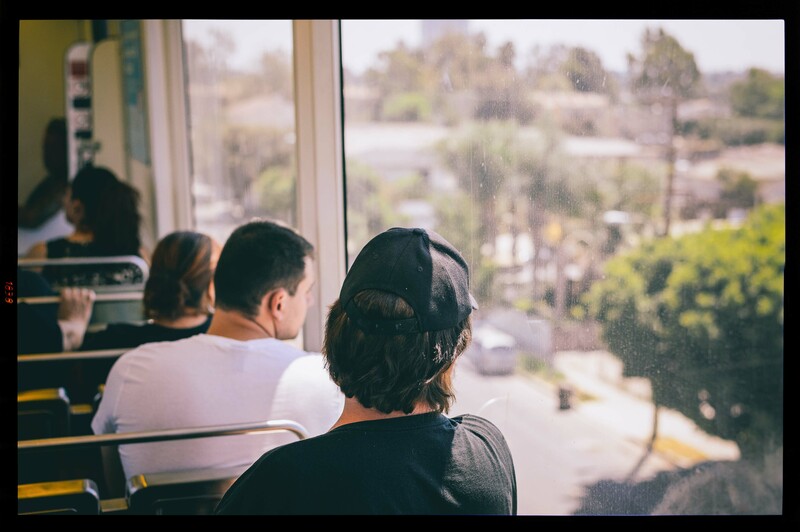 ART OF TRANSIT: The Blue Line headed south toward Compton. Photo by Steve Hymon/Metro. Coverage of the release on Friday of the Eastside Gold Line Phase 2 environmental study. As the article notes, the two light rail alternatives would extend the Eastside Gold Line from East L.A. to either South El Monte or Whittier. Metro staff at this time has not selected a preferred alternative — that will happen in November. Under Measure R, the project is not scheduled to be complete until 2035, but Metro is trying to accelerate funding for the project, including possibly through a sales tax ballot measure in 2016. Here’s our post about the study, with links to the document. The California High-Speed Rail Authority seems to be considering a tunnel under the San Gabriel Mountains on equal footing with two earlier proposed routes along the 14 freeway — neither of which is very popular with communities such as Action, Agua Ducle and Santa Clarita. Bullet train officials say the tunnel-only option advocated by Supervisor Michael D. Antonovich — which would require 18 to 20 miles — of tunnels may actually prove cheaper than the 14 freeway routes, which also require extensive tunneling anyway. If you want to dream about traveling from Palmdale to Burbank in 15 minutes, read the article. The usual bullet train caveat: securing funding for the project — which aims to eventually connect L.A. and San Francisco — remains a huge hurdle. The city and school district in Beverly Hills are touting a new study from their consultants that claims that there are not any earthquake faults that would prohibit a subway station under Santa Monica Boulevard. Metro is sticking by its stance that active faults make building a station under Santa Monica Boulevard unsafe and it’s better from a safety and planning viewpoint to put the Purple Line Extension station in the center of Century City, under the intersection of Avenue of the Stars and Constellation boulevard. Beverly Hills officials want the station under Santa Monica Boulevard because it would not require tunneling under part of the Beverly Hills High School campus. As you likely know, Beverly Hills has challenged the project’s environmental studies with a pair of state and federal lawsuits. The Superior Courts ruled in favor of Metro in the state case and Beverly Hills appealed. The federal suit is ongoing. The 6.0-magnitude temblor that struck early Sunday didn’t do much damage to major transportation infrastructure throughout the Bay Area — although there was certainly damage to homes and businesses and other key infrastructure. 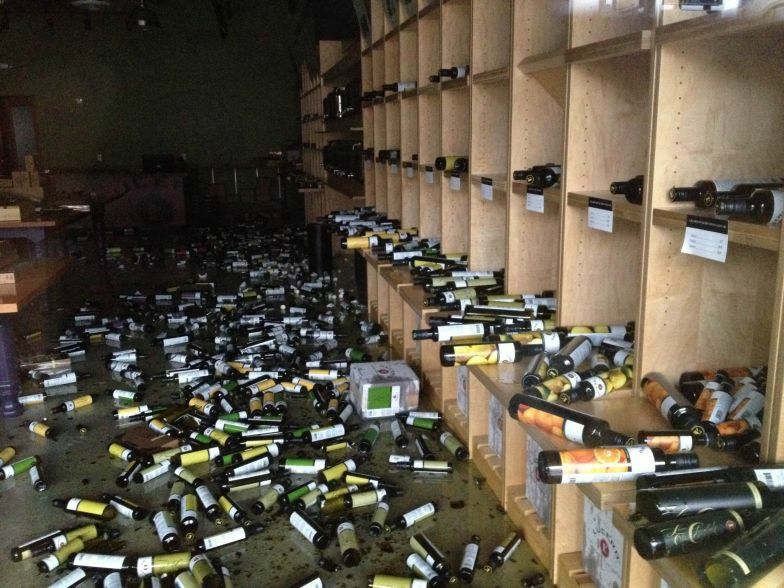 Damage at the Lucero store in Napa. Photo by Matthew Keys via Flickr creative commons. Consumer spending has risen steadily over most of the last decade — with a brief dip due to the Great Recession. But the number of miles driven by Americans has remained flat since late 2007 — even as the number of those with jobs has increased in recent years. What gives? The independent research firm Behind the Numbers suggests that driving less is a trend here to stay and is a combination of several factors including high gas prices, baby boomers growing older, millennials gaining in numbers (millennials are less interested in driving), more interest in transit and more desire by many to live in urban settings. Fortune is a little skeptical, saying that gas prices adjusted for inflation are not outrageous and millennials still don’t play much of a role in the overall economy. My three cents: I’m certainly not a millennial (I’m 48) but I certainly don’t want to drive more or purchase more gasoline than is absolutely necessary. Nor do I like spending money on cars, which notoriously lose value very quickly. I think with good transit, biking and housing options in cities with good public spaces, driving will remain flat in America as along as it remains relatively expensive. With permission from local authorities, hackers in Michigan were able to disrupt timing of traffic lights in an un-named city rather easily. Vox suggests that this is a security concern — and it is certainly illegal to tamper with lights. That said, in my neck of the woods (Pasadena), I’m not sure that the timing of traffic lights could be much worse, the reason other computer hacker targets inspire a little more fear. Why even divert to Palmdale? Just another political ploy to gain support. Hell, they could not even make Palmdale airport work, why run high speed rail there? Another waste of taxpayers money. After the discussions initially broke about the alternative suggestion, I drew up a possible concept route using Google Maps, which would require a ~23 mile tunnel as well as a shorter tunnel through Shadow Hills and a viaduct over the Tujunga Wash. Although I simply followed the DWP right of way (which I’m not sure would be usable as an HSR alignment) there were some comments that it would meet with resistance in Shadow Hills. I therefore included an alternate route through Sun Valley and Pacoima that would unfortunately require a large viaduct to cut through an industrial park (or expensive property acquisition) and the dam spreading grounds. On the plus side, the tunnel would be about 2.5 miles shorter. And the money comes from where? Oh I know, you must be a billionaire with lots of money to waste. Please write a check to Sacramento. In honor, you get a statue in your name. I just hope I live to see HSR in California. Or even just a San Joaquin that departs out of Los Angeles. Of course, those who see the whole business of “Americans falling out of love with driving” as a bad thing will continue to fight it tooth-and-nail. My initial reaction is that it was not well written or researched. They don’t write magazine articles like they used to. Of particular interest was the chart “estimated vehicles driven on all roads (1970 to 2015)”. What is extraordinary is that motor vehicle mileage TRIPLED from a little more than 1 trllion miles in 1970 to over 3 trillion miles in 2006. The U.S. Population only increased by 50% in that time period, from a little more than 200 Million to a little more than 300 million. 1 trillion miles divided by 200 million people comes to 5000 motor vehicle miles per capita. 3 trillion miles divided by 300 million people comes to 10,000 motor vehicle miles per capita. Per person motor vehicle mileage DOUBLED in the last 36 years if this chart is accurate. Where is eveybody driving to today that they weren’t driving to in 1970? It doesn’t appear people were using transit very much more in 1970 than they are now, but that they ARE driving a lot more and probably could do with driving a lot less. The price of petroleum has remained around $100 a bbl for a few years now from .only $25 a bbl only a little more than a decade ago Either this means the price of petroleum has quadrupled or the dollar is worth 25% what it was worth in 2002. Most likely a combination of the two. This has probably EVERYTHING to do with the flatlining of motor vehicle mileage. Not generational changes, aging baby boomers or transit usage. While 30 years ago people were making the long commute from the San Fernando Valley to Downtown L.A. today people are traveling from such places as North San Diego County to Downtown and of course Palmdale to Downtown. I question the use of a Breitbart article as a source for news on this agency’s blog. I try not to pick and choose media outlooks because of political leanings, etc. The reporter reached out to Metro for comment. They have the right to ask questions. Obviously the new study was little covered by other media, which some may find interesting.